#POWEROFTHEPURSE19 is hosted annually by the AZHCC Latina Business Enterprises Group. The event celebrates women in business and brings together 400+ guests to highlight the growing economic impact of women-owned businesses. Power of the Purse will also highlight the work of Arizona Women’s Education and Employment. We look forward to seeing you at the Desert Botanical Garden! 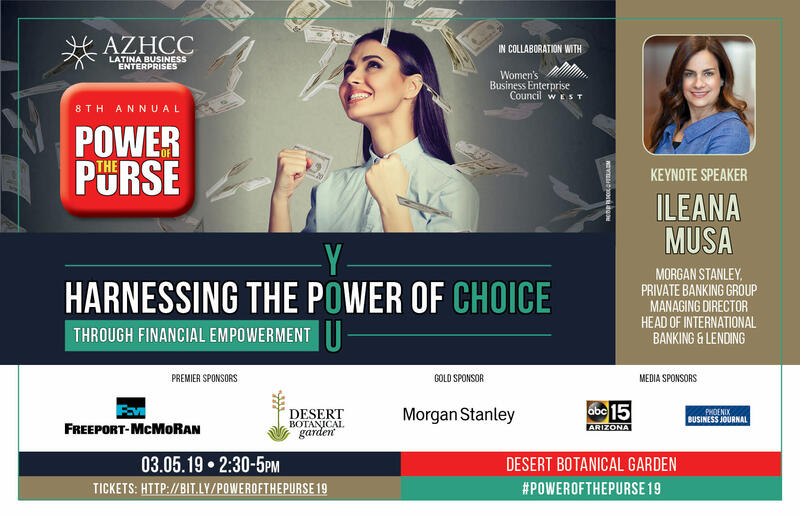 The theme of this year’s Power of the Purse, “Harnessing The Power Of Choice, Through Financial Empowerment" will focus on how women and entrepreneurs can all achieve financial independence. Ileana Musa is our Keynote Speaker. She is Morgan Stanley's Private Banking Group Managing Director, Head of International Banking & Lending. In this role she leads the strategy to deliver comprehensive cash management and lending solutions to international clients in International Wealth Management. Your registration includes a complimentary entry to the garden. Experience "Electric Desert" exhibition in the garden. To learn more click here.